Does the War on Poverty Fight Destitution or Subsidize It? The Census Bureau will be releasing new poverty-rate numbers on Thursday and the numbers are expected to show a big move in the wrong direction. Much of the coverage will be on how much the poverty rate increases, with 15 percent being a likely amount according to some estimate. There also will be lots of discussion about the political implications, as this Associated Press story illustrates. The number of people in the U.S. who are in poverty is on track for a record increase on President Barack Obama’s watch, with the ranks of working-age poor approaching 1960s levels that led to the national war on poverty. Census figures for 2009 — the recession-ravaged first year of the Democrat’s presidency — are to be released in the coming week, and demographers expect grim findings. It’s unfortunate timing for Obama and his party just seven weeks before important elections when control of Congress is at stake. The anticipated poverty rate increase — from 13.2 percent to about 15 percent — would be another blow to Democrats struggling to persuade voters to keep them in power. But the real story should be the degree to which the federal government’s War on Poverty has been a complete failure. Taxpayers have poured trillions of dollars into means-tested programs, yet the data show no positive results. Indeed, it’s quite likely that the programs have backfired. As shown in the chart, Census Bureau data reveal that the poverty rate was steadily falling in the 1950s and early 1960s, but then stagnated once the War on Poverty began. It’s possible that there are alternative and/or additional explanations for this shocking development, but government intervention may be encouraging poverty by making indolence more attractive than work. Okay, I have bad news. Your table is not accurate. I work with Census data all the time and I could not find any Poverty data prior to 1959. Because it doesn’t exist. The Census did not issue Poverty figures prior to 1960. I don’t know who made up the data on 1950-1958 Poverty Rates, but it did not come from the Census Bureau. 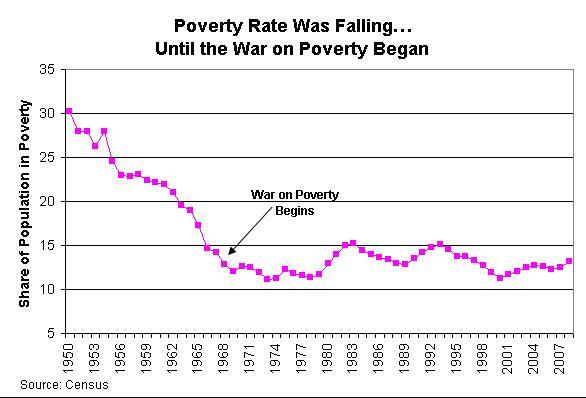 Why does your graph show the “War on Poverty” as beginning in 1968? The first Great Society programs were launched in 1964. If you look at 1964 as the beginning of the War on Poverty, you see a very large drop until 1969. Only the drop from 1950 to 1956 is comparable, and we’ve seen no comparable drop since 1969. Of course if you randomly choose to start in 1968 it looks like nothing happened. The economic theories of John Maynard Keynes are so gay. my only criticism here is that, for example, leftists like to point to the slowing of job losses in the economy as a sign of the Obama stimulus’s success; conservatives counter by saying that of course the marginal unemployment rate will naturally slow on its own as more and more people become unemployed; otherwise, 100% of the population would eventually be unemployed. so couldn’t it be said that the poverty level in this country had fallen to the point that it couldn’t really go any lower, and thus is not the fault of the War on Poverty? I’m just playing devil’s advocate here. what do you all think?